Hello everyone, Welcome to my blog post. Hope you had a lovely weekend. 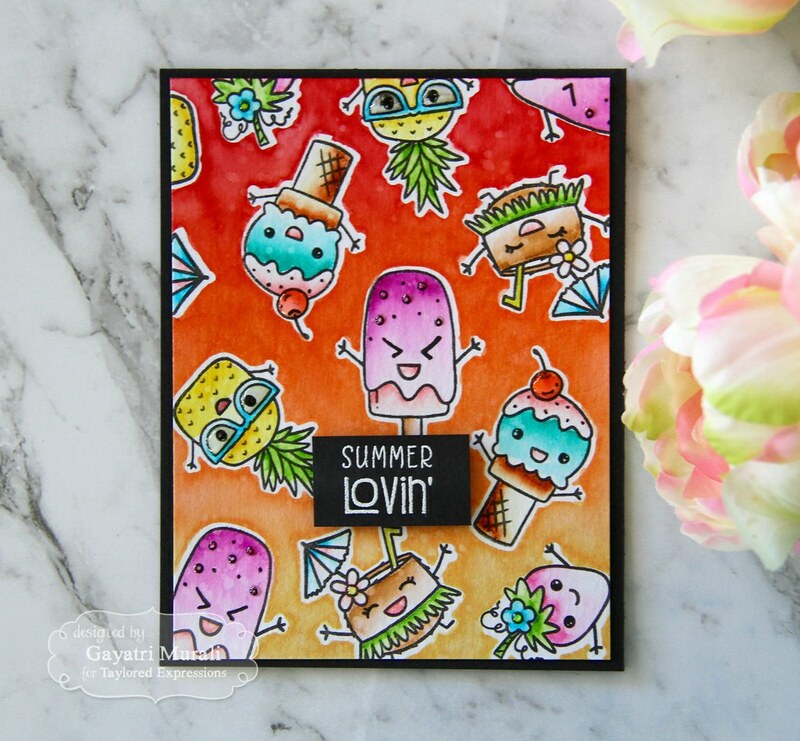 I am sharing with you a bright summer lovin card using one of the new stamp set called Super Sweet and coordinating die from the Clearly Planned May release from Taylored Expressions. These are not rubber stamps but clear stamps. Such a cute stamp set. The faces on the images are adorable. 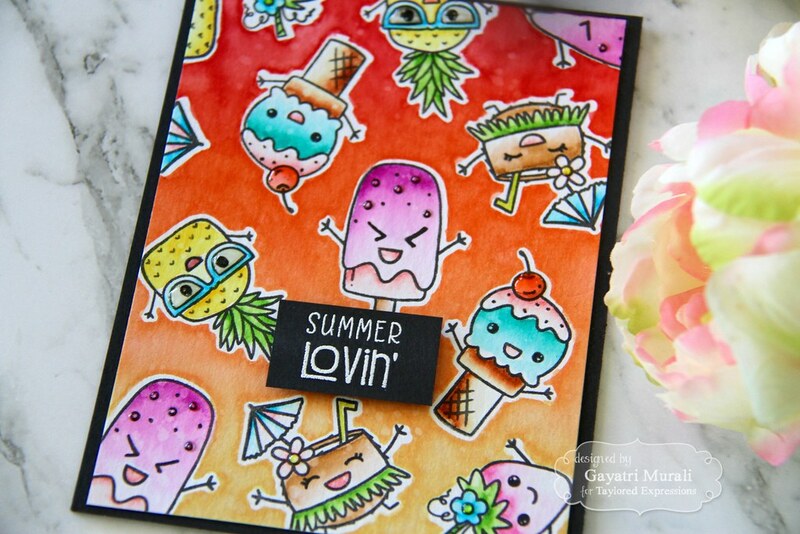 These stamp set and die are designed to be used on planners but I also think they are awesome to be used to make cards. 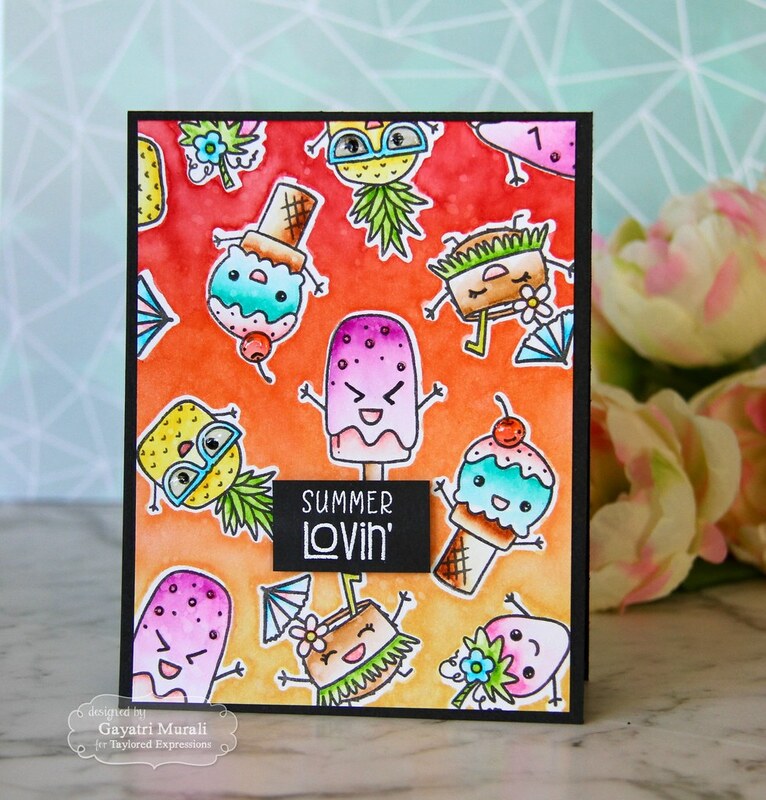 Here is my card using both the stamp set and dies. Trim a Sugar Cube cardstock 1/4th size smaller than the card front. That will be 4″ x 5.25″. Die cut three of each images from the coordinating die using masking paper. Adhere them randomly on the white panel. Burnish them using bone folder. Using the mini round sponging tool, I sponged Candied Apple, Ripe Persimmon and Dried Marigold Distress Ink on the panel. I sponged them twice to get good saturation and even blending. Removed the masks and sprayed the background with mini mister to get the colour moving but not very much. Used paper towel to dabb off the excess water. I still want to keep the white masked areas white. If I keep the masks and spray water, the colour will seep through the mask and contaminate the masked areas. You could use water brush to do the previous step too. Then I stamped the coordinating images on the white masked areas. I coloured the images using Zig clean color brush pens. I used glossy accent to add dimension and texture to some area on the images and left the panel to dry. I prepared an Oreo card base. Once the panel is dry, I adhered the panel to the card front using adhesive tape. For the sentiment, I white heat embossed the sentiment from Super Sweet stamp set on a strip of Oreo cardstock and adhered to the card front using foam adhesives. Check out Taylored Expressions Blog for more inspirations from rest of the designers. Thanks for stopping by my blog today. Have a super sweet Monday!